College is a scam. At least, that’s what quite a few extremely intelligent and successful Americans have been saying over and over for the past few decades, as the cost of higher education continues to skyrocket like never before in history. 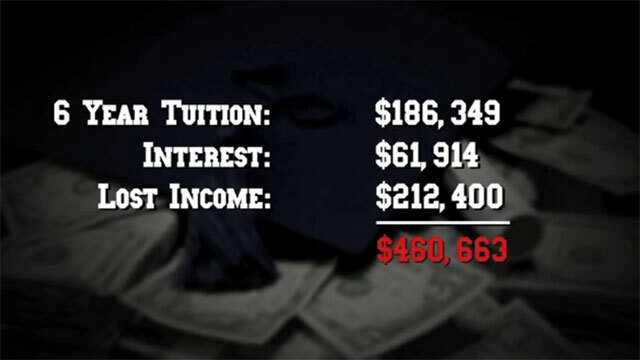 College Conspiracy, an online documentary first released in 2011 that continues to attract thousands of views, debunks common myths about American college education – such as that college graduates earn an average of $1 million more than non-graduates in their lifetime – and provides a passionate overview of the (mostly government) forces that drive soaring college costs in the United States. There is no longer anything special about a college degree in America, if 70% of everybody else is also attending college to receive one. NIA is working hard to ensure that it will soon become college knowledge in the US that a college degree offers no advantage over the rest of the population. When Americans finally learn the truth, the college bubble in America will burst. At one point, the video references a “2008 Pharmacist Shortage Hoax” in which 15 new pharmacy schools were built despite an apparent job shortage among recent graduates. Economic “experts” appeared in the American media claiming that pharmacists were to become one of the most in-demand jobs in America until at least 2020 – an apparent attempt by investors to cash in on recruiting students to their new schools. While this is a common theme here at CollegeTimes, where thousands of students have reported being duped by for-profit education companies promising lucrative careers, the film’s producers appear unwilling to place any blame on private enterprise. There are a few other bizarre points made in the video, which seem to put into question the project’s anti-government stance. For example, a for-profit college president is quoted as saying that he is “legally forced” to increase tuition costs because of the 90/10 rule that requires for-profit institutions to make more than 10% of their “profits” from sources other than federal student loans. The narrators do not expand on his rather bullsh*t attempt to skirt blame for costly tuition – presumably out of ignorance, or over-ambitious support for their free market arguments. But the truth is that regardless of total student cost, finding 10% of revenue streams from non-government sources is easily achievable for reputable institutions (most for-profit scam schools are simply NOT in fact reputable, and force their students to buy unnecessary laptop computers, etc, instead). The video concludes by asserting that cheap, internet-based higher education is the future. And with websites like Academic Earth, Khan Academy, and Coursera growing rapidly around the world, the future of digital education indeed looks promising. Although it is very true that the cost of a university education is rapidly increasing it is difficult to consider it worthless. There are still some community colleges that are much cheaper that can still lead to a degree. Staying in the USA after getting a degree is definitely a mistake. Leaving the USA and working overseas is much easier with a degree since it is often a requirement for a work visa. I have always been able to easily find work, and good paying work, overseas.